I potted the plants in a manner that the most striking color of a tiny pot will going to match with flowers of the plant. Pink one is having pink Impatiens sapling. These tiny beauties are spreading happiness in my living room. These pots are so beautiful Disha and the colours so thoughtfully co-ordinated with the plants in it. Super idea . Bravo ! So lovely! 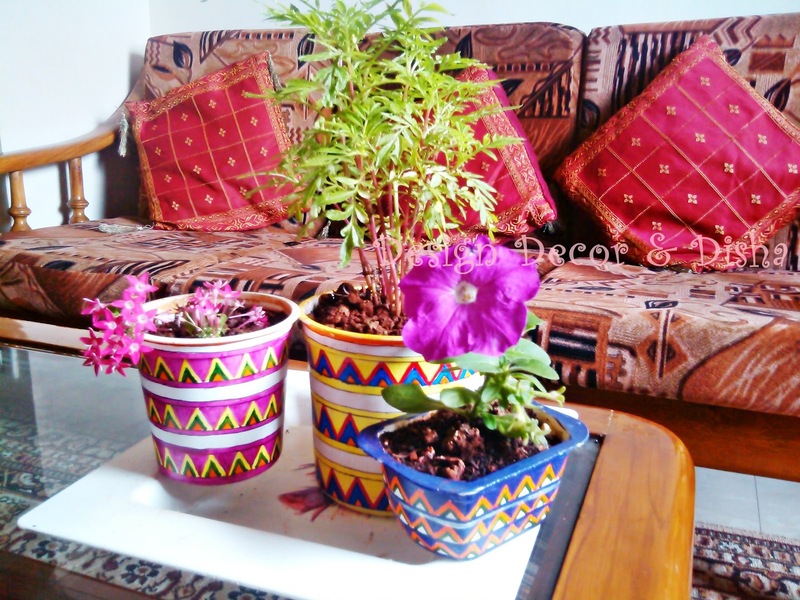 I love recycled pots and your colours are so happy! 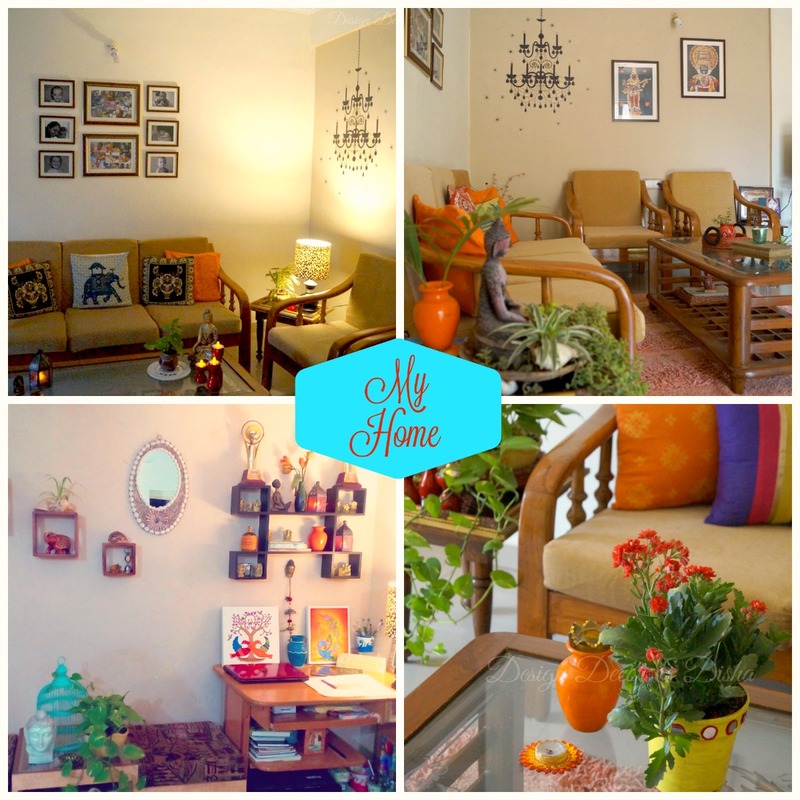 A very happy 'room for living', indeed!Such vibrant and lively colours! Gorgeous... I made planters out of plastic containers but not at all colorful. What medium did you use? I tried acrylic but it failed for me!! That table looks real colourful. 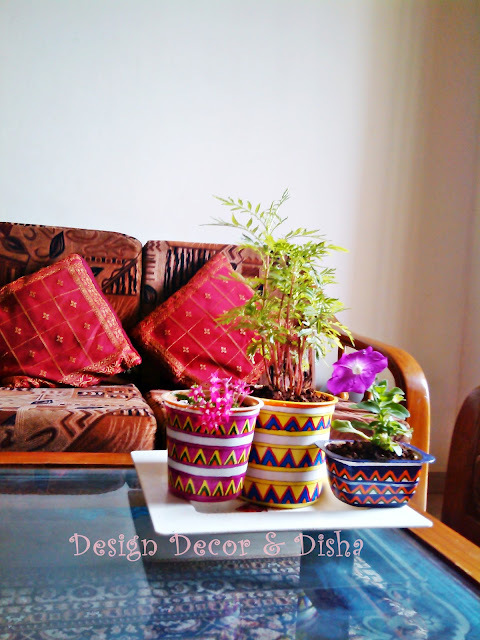 I wanted to ask too what medium did you use to colour plastic containers?Have collected lot of them but still thinking of how to go abt it.Your beautiful pots inspired me to take it up. I used acrylic colors. Though you can use enamel colors also. Thanks a lot that you liked my work. Disha, your pots are gorgeous. Looks like a lot of work, but it paid off. How much more exciting your plants now look! 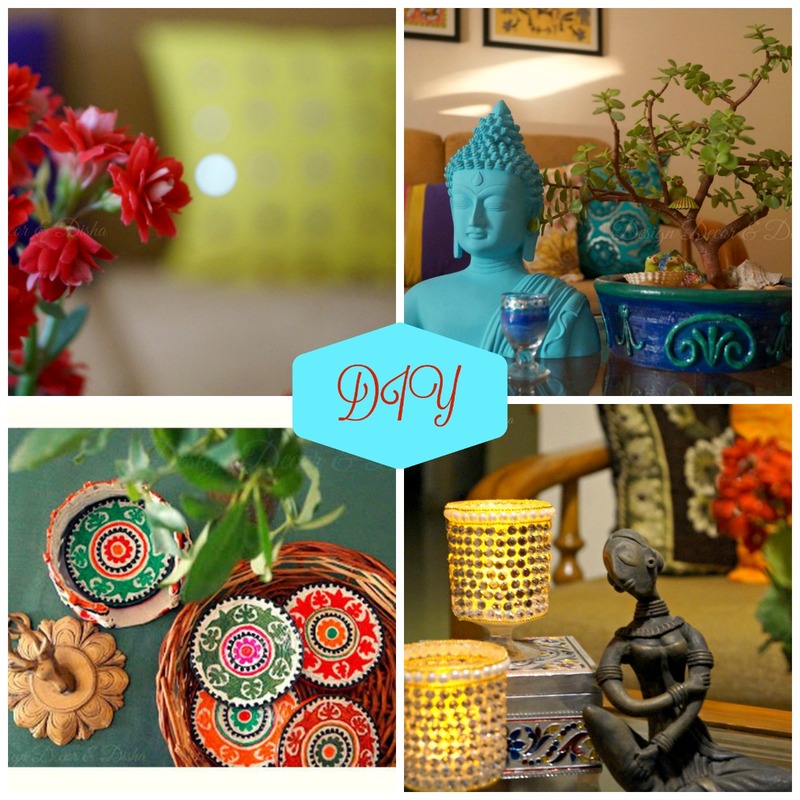 Wow- your up-cycling is stunning! Love everything about these! A great way to brighten up winter!! Happy PPF and Happy New Year!! 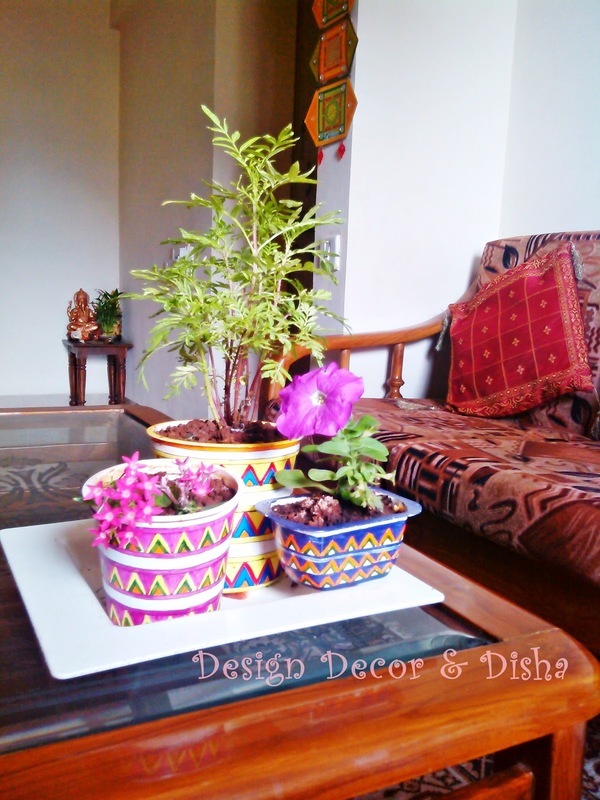 These planters are so beautiful-such lovely, happy colors that fit so well in your room Disha! Happy PPF and happy 2013! Cute painted pots a great idea! HPPF ! Faye, Carolyn, Mary, Anne, Linda, Lynn Thanks a bunch to all you lovely ladies. First time here and happy to have discovered your blog. The color combination in the pots is really lovely. @ Priyanka: Thanks a lot girl!! 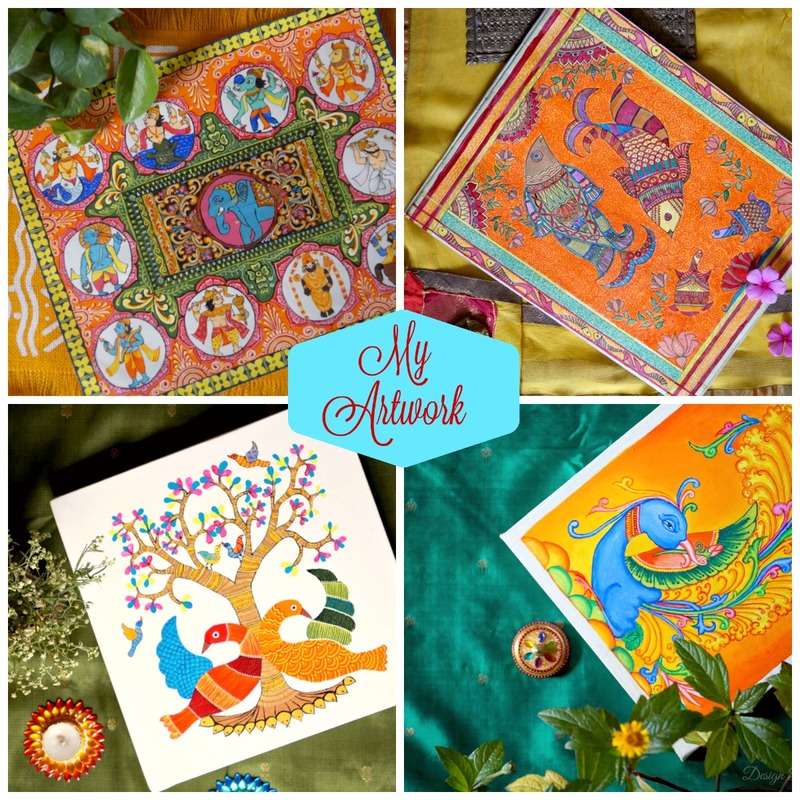 @Lakshmi: Thanks for stopping by. I am really very glad that you liked my work.